Recently, I noticed how close are the two PDE based approaches from Andreasen-Huge and Hagan for an arbitrage free SABR. 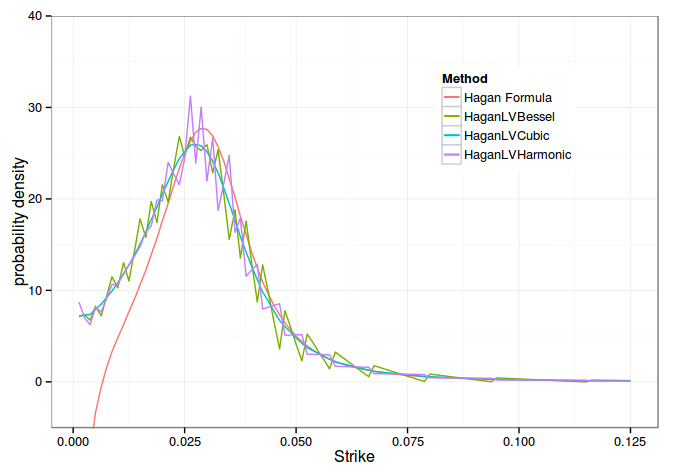 Hagan gives a local volatility very close to the one Andreasen-Huge use in the forward PDE in call prices. A multistep Andreasen-Huge (instead of their one step PDE method) gives back prices and densities nearly equal to Hagan density based approach. Hagan proposed in some unpublished paper a coordinate transformation for two reasons: the ideal range of strikes for the PDE can be very large, and concentrating the points where it matters should improve stability and accuracy. 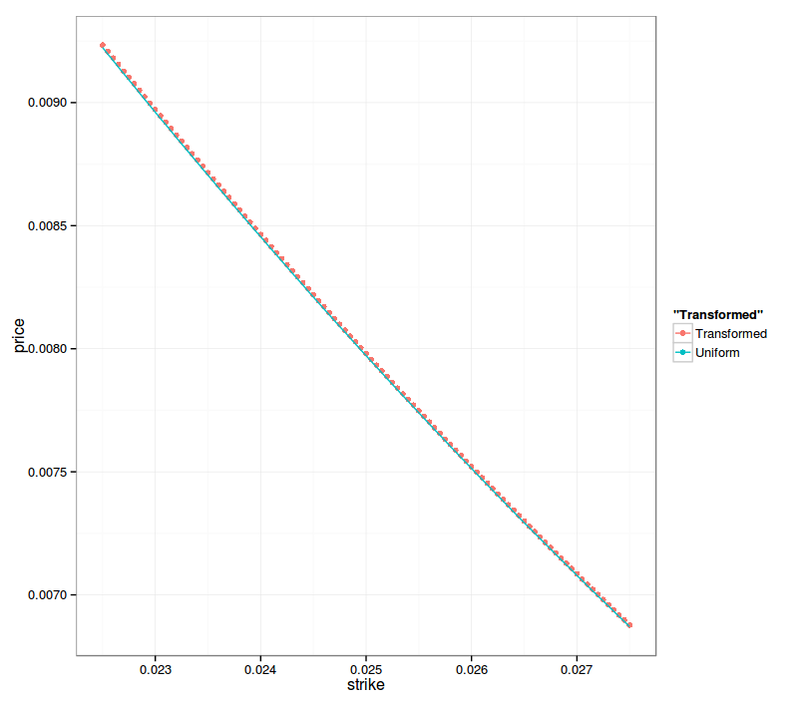 The transform itself can be found in the Andersen-Piterbarg book "Interest Rate Modeling", and is similar to the famous log transform, but for a general local volatility function (phi in the book notation). through a non-uniform grid: the input strikes are directly transformed based on a uniform grid in the inverse transformed grid (paying attention to still put the strike in the middle of two points). This is detailed in the Andersen-Piterbarg book. through a variable transform in the PDE: this gives a slightly different PDE to solve. One still needs to convert then a given strike, to the new PDE variable. This kind of transform is detailed in the Tavella-Randall book "Pricing Financial Instruments: the Finite Difference Method", for example. Both are more or less equivalent. I would expect the later to be slightly more precise but I tried the former as it is simpler to test if you have non uniform parabolic PDE solvers. It works very well, but I found an interesting issue when computing the density (second derivative of the call price): if one relies on a Hermite kind of spline (Bessel/Parabolic or Harmonic), the density wiggles around. The C2 cubic spline solves this problem as it is C2. Initially I thought those wiggles could be produced because the interpolation did not respect monotonicity and I tried a Hyman monotonic cubic spline out of curiosity, it did not change anything (in an earlier version of this post I had a bug in my Hyman filter) as it preserves monotonicity but not convexity. The wiggles are only an effect of the approximation of the derivatives value. Initially, I did not notice this on the uniform discretization mostly because I used a large number of strikes in the PDE (here I use only 50 strikes) but also because the effect is somewhat less pronounced in this case. I also discovered a bug in my non uniform implementation of Hagan Density PDE, I forgot to take into account an additional dF/dz factor when the density is integrated. 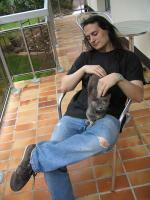 As a result, the density was garbage when computed by a numerical difference. 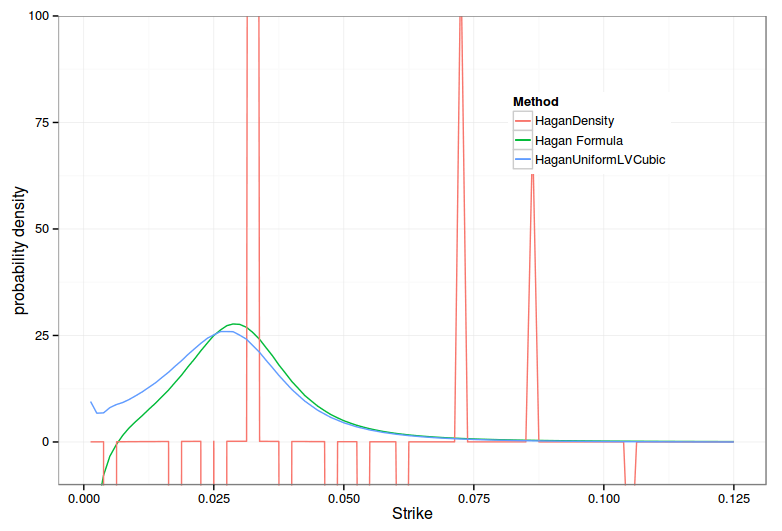 "Bad" Call prices around the forward with Hagan Density PDE. Notice the jumps. 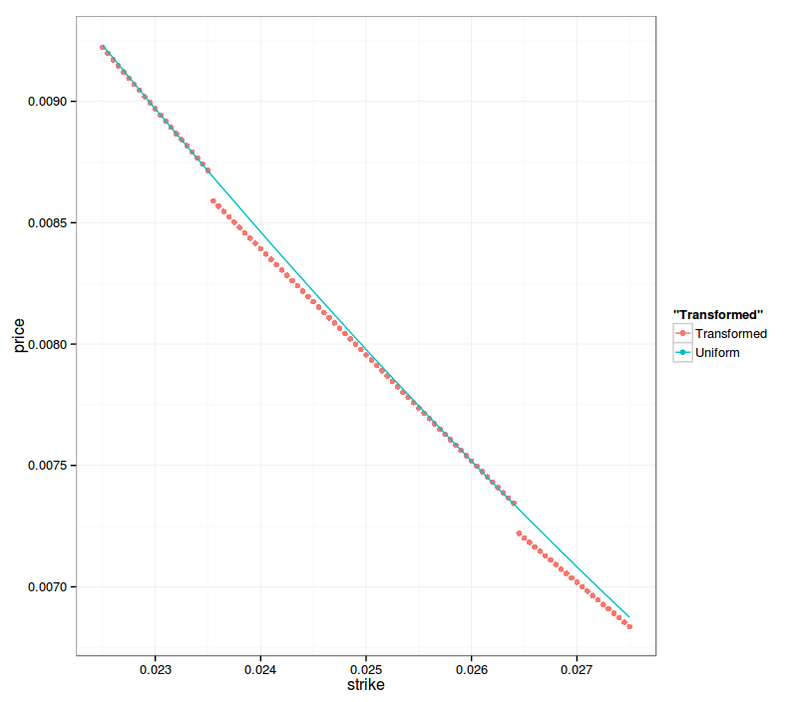 Update March 2014 - I have now a paper with Matlab code "Finite Difference Techniques for Arbitrage Free SABR"